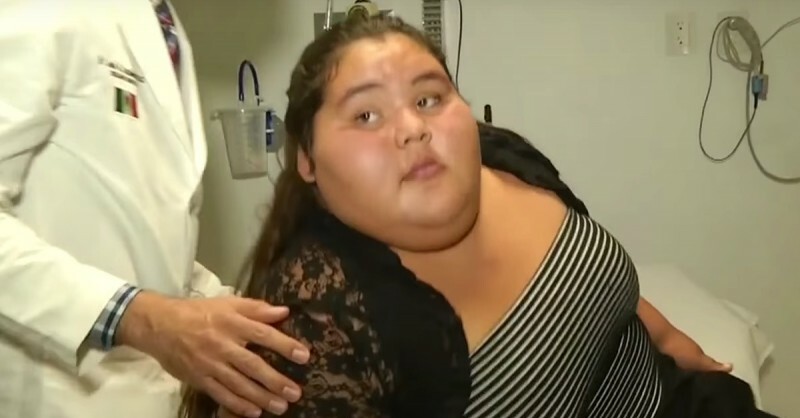 Dayana Camacho, a 15-year-old teenager from Mexico, came to weigh an astounding 430 lbs. The girl from the city of Sinaloa didn’t pay attention to what she ate and led a completely sedentary lifestyle. Little by little she began to gain weight until she earned the dubious title of "the most obese minor in the world." Her excessive consumption of junk food and candy combined with a lack of exercise proved to be extremely damaging to her health. Things got so bad with her weight that when she slept, she would stop breathing for periods of time — a condition known as sleep apnea. Ramona Carrillo, her mother, would constantly have to move her just to make sure everything was okay. But the severity of her daughter's condition was as clear as day, quite simply because Dayana was physically unable to walk or do any of the things that normal adolescents do. It was then that Ramona decided to do something very brave: she called a radio station and asked for help for her daughter. And that's how the impressive transformation began that would change her life entirely. Specialists came to Dayana's rescue and in the process she abandoned all her bad habits and began to eat healthily and start exercising. But because of the seriousness of her case, it was also necessary for her to undergo a gastric bypass in which her stomach was reduced to 20 cubic inches. The operation aimed to reduce the amount of food that Dayana could eat and satiate her easily to eliminate any kind of anxiety. For months Dayana fought the temptation to go back to drinking sugary beverages or eating junk food, but thanks to psychological support and her operation she was able to stay strong and not relapse. And nine months later... she lost 198 lbs!! Such tremendous weight loss is only due to the incredible effort she put in and her unfaltering dedication. But Dayana’s journey is still far from over. Her ultimate goal is to get down to 150 lbs — a huge challenge, but one that Dayana is prepared to take on. "Now she's a teenager who can walk, even run, and soon she'll be enrolled back in school. There’s no longer any bullying, and she has now initiated contact and gotten closer to her companions, her friends and her family," said the doctor who is helping her through all this change. Dayana feels lighter and prettier — she can now even wear her favorite garment: dresses. The road is long and the obstacles will get harder, because those last pounds are always the most difficult to lose. But everyone is confident Dayana has what it takes to reach her goal. She has come so far and has already reaped the benefits of her efforts. Childhood and adolescent obesity is a serious problem that has been on the increase in many countries around the world, especially in Mexico. Cases such as Dayana’s are not that strange and are the consequence of a poor diet and an extremely sedentary lifestyle. Her story lets others know that they can change the way they behave to achieve a much healthier and social lifestyle. We wish her all the best in achieving her final goal!